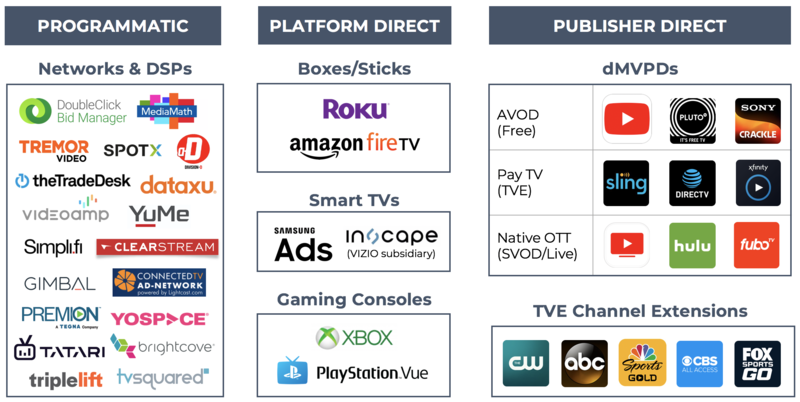 We introduced the advanced TV landscape in part 1 of our over-the-top (OTT) blog series, followed by an OTT / connected TV (CTV) measurement deep dive in part 2 and a feature on Amazon Fire TV in part 3. In this post, we’ll be applying that knowledge to CTV advertising at large with a beginner’s guide to OTT media buying. Perhaps the biggest takeaway so far has been the growth potential for OTT and what that means for digital performance advertisers. Although OTT represents less than 5% of total U.S. TV ad spend, linear TV spend has been declining since 2016 (according to MAGNA & eMarketer). Conversely, OTT ad spend grew by 40%+ last year and can be found in at least 80% of U.S. WiFi households (according to MAGNA & comScore) . 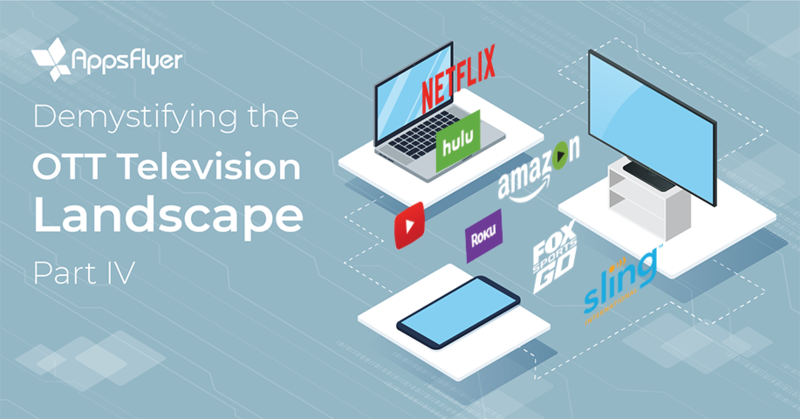 The emergence of OTT and addressable TV has opened the playing field for TV buying by lowering minimum spend requirements, increasing targeting options, and providing a more seamless path for cross-screen retargeting. However despite its potential, one common misconception is that the performance of OTT ads on CTV will be in line with digital. In actuality, CTV is more of an upper funnel tactic than a performance lever. Typical CTV video CPMs fall in the $20-40 range and true cross-screen / multi-touch attribution is still somewhat limited, which means the effective CPI or CPA of a CTV campaign will likely be much higher than that of desktop or mobile. That being said, CTV can be very impactful for driving awareness and cross-screen adoption of OTT apps if used in the right way. In general, there are three ways to access OTT inventory through addressable buying: programmatic, platform direct and publisher direct. *The above partner list is a sample set, and is not necessarily reflective of the “best” or “top” companies under each section. HULU has offerings falling into all three dMVPD categories above, not limited to Native OTT. Programmatic: DSPs and ad networks are often the easiest place to start for those new to CTV due to their wide reach across platforms, lower minimum spends, cheaper cross-screen blended CPMs (i.e. CTV + mobile video), sophisticated audience segmentation, and advanced reporting options (e.g. platform/publisher-level reporting + cross-device graphs). Although 3rd party data and private marketplace (PMP) deals can offer a variety of niche targeting options, targeting typically cannot be guaranteed at the program or platform level. Programmatic ad formats are limited to non-clickable video (i.e. mid-roll) for now, as OTT platform providers hold the keys on homepage placements and clickable display formats. Platform Direct: Beyond targeting considerations, buying directly from the OTT platform provider can sometimes lend lower rates and more placement options. For example, Amazon Fire TV and Roku offer clickable display banners, which tend to yield lower eCPIs than a typical mid-roll ad. However, each OTT platform has its own rules of play. For example, smart TV partners (i.e. Samsung Ads, Inscape) offer native placements across linear TV as well as OTT. Others are more restrictive, warranting PMP or publisher direct deals to access certain inventory; Apple TV does not sell ads in-house, while Xbox and PlayStation only sell direct inventory to those who have an app on their respective platform. Publisher Direct: Lastly for big TV and OTT app advertisers who want to guarantee placement in specific programs or channels (e.g. HULU, FOX NOW), publisher direct may be the way to go. Just keep in mind that some OTT apps have competitive restrictions in terms of which advertisers they will accept. Interest-based profiles can be expanded programmatically by combining web and app install/usage data—pulling audiences from DMPs like eXelate, Data Alliance, Twine, PushSpring, Skydeo, Datalogix, Neustar, BlueKai, Epsilon, etc. OTT can be relevant to many types of advertisers—from mobile app owners to new OTT/mobile app owners to big brands who are already spending on linear TV, each has its own goals and distinctions to consider. For the purposes of giving a single and detailed example on how to devise your first OTT media test strategy, we’ve chosen to focus on the middle category: new OTT/mobile app owners. Even if you don’t fall into this category, the rationale described in each of the two scenarios below may give you inspiration that can be adapted to your specific use case. You manage a free, ad-supported TV content service across desktop, Android, iOS, Roku and Fire TV that just launched last year. You have limited budget and strict acquisition performance goals, with little room for upper-funnel testing. Thus far your paid media efforts have been focused exclusively on mobile, where you are able to achieve a $1-3 CPI. Your analytics team tells you that user LTV is 6x higher on TV screens and that TV users become stickier and more frequent viewers, but you also know that TV advertising can be very expensive. The minimum measurement requirement under both scenarios is site-served reporting, but of course, we highly recommend working with an MMP to streamline your reporting process with advanced analytics (e.g. in-app event measurement, custom attribution windows, ROI/LTV reporting, etc. with AppsFlyer). You also have the option of integrating a marketing cloud platform for additional visibility on probabilistic mobile/web attribution from OTT TV. Some DSPs are able to offer cross-device graphs for free (scenario B), but there are advantages of working with specialist partners at added cost. To learn more about OTT and how to upgrade your measurement strategy with AppsFlyer, contact your Success Manager or schedule a free consultation with one of our measurement experts. Larissa leads AppsFlyer's product marketing efforts in North America, guiding strategic initiatives across client, partner and agency relationships. Larissa brings a unique perspective to the team with seven years of agency experience in cross-platform media planning and marketing strategy. Through previous roles at M&C Saatchi and Carat, Larissa has worked closely with leading brands including Microsoft, Amazon, Sony and Red Bull.